What an interesting question. Puts a whole new twist on wind correction angle i.e. "pilot correction" angle - huh?. Perhaps a trim-tab setting for individual pilots? Seriously though, that would be a good question to see if AE had a historical tendancy to be left or right of her target. Any way to figure that out? If the directional gyro was drifting, and they all do, then the autopilot or the human pilot will follow it and steer off course. An example will help. Earhart sets the DG to agree with the compass and then sets the autopilot to fly a true heading of 157°. (I am simplifying this by leaving out the complication of variation, deviation and wind correction angle.) The pilot or autopilot controls the plane so that 157° stays under the lubber line (the heading index line). After ten minutes the pilot checks the compass and finds that the plane is now heading 147° even though the DG still shows 157°. The DG has drifted ten degrees. The pilot then resets the DG to 147° and then turns the plane back to 157° on the DG (or the autopilot makes the turn back to 157° on the DG.) However, during that ten minute period the plane was making a gradual turn to the left so the average heading actually flown was 152° so the plane has drifted 5° off course to the left. Most likely the DG will continue to drift at the same rate so if the pilot continues to just reset the DG as described then the plane will actually fly 152° not 157° over time. A 5° deviation will place the plane 29 NM (33 SM) off course on a leg of 350 NM from Howland to Gardner. If the directional was drifting, and they all do, then the autopilot or the human pilot will follow it and steer off course. Yes, that's why you periodically reset the DG. It's as basic to cross-country flying as switching fuel tanks or leaning the mixture at altitude. AE and FN were both highly experienced long-distance flyers, much of it by DR. If they couldn't fly competently when they were tired they wouldn't have lived as long as they did. If the visibility was 20 NM or less, which seems quite likely, then the furthest they could possibly see Gardner was 20 NM or less. Why would you think the visibility was 20 nm or less? According to Itasca's deck log, visibility that whole morning was "9" - the maximum on the scale, defined as "Prominent objects visible above 20 miles." You could be standing across the street from the Empire State Building and if the fog limited visibility to 20 feet then you would never see the building. It doesn't matter how big an object is or how high the plane is you still will be limited by the prevailing visibility. Lost, looking for islands in a sea of nothingness, above the clouds? Even for AE = Doubtful! The website is chock-full of information to help you decide what is and is not reliable. Yes, of course, it is not necessarily the "exact wording." Maybe she really said "South and North" and the operator wrote "North and South." I'm satisfied that it is probably sufficiently accurate to tell us what they were doing. YMMV. Don't just talk about it. Do it and let us know how it turns out. TIGHAR is up to its neck in funding the interpretation of the last expedition and designing the next. The organization is sold on the Niku Hypothesis. All you get from the simulation is a sense of how the aircraft may have ended up at Niku; knowing the exact path is of no use whatsoever in searching for the wreckage or other telltale material from AE and FN. The whole question is moot: something about which reasonable people may reasonably disagree; something that can be argued endlessly; something that makes no difference to the next steps that need to be taken. The assumption that counts is that the flight ended at Niku with sufficient fuel to account for the post-loss radio messages that seem to be credible. Any number of flight paths from Lae to Niku can lead to that result. O.K., 21 miles based on Itasca's deck log. You don't think it was a 100 NM, do you? Visibilities over the ocean are never that great which is why the scales max out at 25 NM in the Climatic Atlas and at 20 NM in the Navy reporting scheme. They may exceed 25 NM but never by much. 60% probability = "quite likely" in my dictionary. But Itasca was 350 NM from Gardner and there was no reported weather observation taken at Gardner that day so my basis, as I stated, is the U.S. Navy's Climatic Atlas for the Gardner area for any day in the month of July of any year. Do you have any other information that is more authoritative as to the conditions at Gardner on that date? We can also compare the visibility as observed at Howland with the expected conditions at Gardner. Based on the Navy Climatic Atlas, in the vicinity of Howland in July, you can expect visibility less than 25 NM 70% of the time; less than 20 NM 60%; less than 15 NM 50% and less than 10 NM 39% of the time. So 40% of the time the visibility will equal or exceed 20 NM. Itasca logged at least 20 NM so there is a 10 % chance that it was more than 20 NM but less than 25 NM and only a 30% chance that it exceeded 25 NM and probably not by a lot more than 25 NM. Comparing this with the data for the vicinity of Gardner shows a three times higher likelihood that the visibility was more than 25 NM at Howland than at Gardner (30% compared to only 10%.) Based on this comparison, the visibility I stated for the Gardner area is quite reasonable and has more support than any other speculation about it. O.K., below the clouds, visibility limited only by the prevailing visibility, 90% probability it was less than 25 NM and 60% probability that it was less than 20 NM. She didn't complete her instrument rating so she could not have qualified for CAT 3 authorization. And the Electra didn't have a radar altimeter so it couldn't even qualify for CAT 2 approaches. But you are trying to avoid my point, that the distance that they could have seen Gardner was limited by the prevailing visibility and that the size of the island doesn't change that one bit. To be honest this is something that I've mulled over for awhile now. I have a modest background in numeric methods and have worked on mathematical modeling before (finite differencing models used to predict the behavior of solid-state devices). It used to be the case that custom software was needed in order to do this sort of work, but this is the era of Matlab and heavy duty MS Excel scripts and plug-ins. The only problem is getting the free time necessary. After attending the Tighar Field School, I've started to put a lot of my free time into wreck chasing, for example I will be hiking to the summit of Mt. Whitney this weekend to check out the pair of F6F Hellcat's that crashed back in '46. If others in Tighar were to feel that a new MC Simulation has value though, I would be more inclined to put the time into it. That may be true, but isn't that the whole point of this thread? Yes, but the point is that if we accept the Niku hypothesis and work backwards, we might be able to rule out some of those flight paths and perhaps have a better understanding of what happened and perhaps even what went wrong. This seems to be a reasonable goal and something that could also benefit from a MC simulation. Unfortunately for your simulation, the trees on Gardner would not be silhouetted above the horizon. From 3,000 feet the horizon is 72.1 SM away (I assume that you are using statute miles.) This is from Table 9 of Bowditch or by formula: distance to the horizon (SM) = 1.317 times the square root of the height in feet. The 100 foot high trees are only 1.3 minutes of arc (1/60 of a degree) tall at that distance. Because your diagram is for 50 SM, the island and its trees would appear about a quarter of a degree (16 minutes of arc) below the horizon, so the 100 foot tall trees would not pierce the horizon. To be tall enough to break the horizon the trees would have to have been more than 1200 feet tall! Looking at your second example, 25 SM, the same situation applies. From 1500 feet the horizon is 51.0 SM away and your island is only 25 SM away so is also well short of the horizon At this distance the trees are 2.6 minutes of arc tall. The island, only 25 SM away, is also more than a quarter of a degree below the horizon (19 minutes of arc) so, again, the trees would not pierce the horizon. To be tall enough to break the horizon the trees would have to have been more than 700 feet tall! Your last example, 10 SM at 1,000 feet, puts the horizon is 41.6 SM away. The island, only 10 SM away, is 23 minutes of arc below the horizon and the 100 foot high trees are only 6 minutes tall so the tops of the trees will be 17 minutes below the horizon so also will not be silhouetted against the sky. To be tall enough to break the horizon the trees would have to have been more than 350 feet tall! Don't rely on Google earth, do the trig yourself. Erik, if you "flew" the route from SW of Howland on Google Earth at 1,000 feet and did a 360 degree search, as you fly, is it possible to see any other land? Not really. The only other 'land' is McKean, which is more of a reef/atoll environment more so than it is real land. Even McKean would have been approximately ~50 miles away from a SW Howland-Gardner route, and difficult, if not impossible to see. Without any vertical elevation McKean would have been way over the horizon. It would have been doubtful it was visible unless flying at higher altitudes such as 6,000 thousand feet or greater. 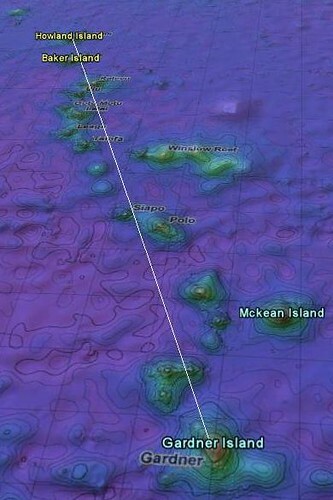 The other possible visible features (at 1,000 feet) may have been the chain of reefs enroute. They look like islands in the map below, but they are not. Although not land per se, these reefs may have provided visible whitecaps if the tide was just right. I don't think so but it would be nice to have more info. As pointed out in previous posts we should not rely on the accuracy of Google Earth as it is only a software program that has some issues. Perhaps the new X Flight simulator will give a more accurate representation. Using Google Earth as a model to generate simulations and provide graphics to back up verbal and written concepts is where it is very powerful tool! It's mathematical coordinate precision for inputing your own data is accurate to 6 decimal places of a degree, which is roughly about 4 inches. So, in other words, it is not Google Earth itself that is in question, but rather the originating source that is being used. To derive the height of the island, I mainly used maps on TIGHAR's own website and recounts of the of the buka trees height to generate the dimensions of the models used here. After researching, I found these figures were fairly accurate with Google Earth coincidently. If I didn't have both sources, you are correct, I would have abandoned Google Earth's accuracy and sought additional information. But in this case, they all matched. I decided to do some checking on the accuracy of Google Earth coordinates to make sure they were accurate in the Pacific. I found the published coordinates of Mili airport, 6º 05' N, 171º 44'E; Mujuro airport, 7º 03' 44'' N, 171º 16' 19" E; and Kosrae airport, 5º 21' 25" N, 162º 53' 30"E since these were the closest to Howland. Then going to them with Google Earth I found that the Google Earth coordinates were exactly right, correct to the accuracy of the positions given in the airport database. Mili was only given to the nearest minute but the others were to the second. ( A second is only 100 feet!) You can check for yourself, just go to Google Earth with those coordinates which you will see fall on the runways. Ok---I'll ask the question of our navigator friends. IF the weather was cloudy during the nighttime part of the flight, Fred would NOT have been able to shoot a celestrial plot. So, when he was able to shoot the 157/337 sunline, how would he have known where along the sunline he was? He wouldnt have been able to guage their drift, so they actually "could" have been south of Gardner. AT 1000 feet, they may not have been able to see Howland, which "could" have been a few miles over the horizon from their position. So--as they flew south along the sunline, they came across Gardner. Does this make any sense to anyone?? knot wind he would have gotten 1418 Z and 1502 NM. be limited to 10 miles for every 100 miles that they had flown since their last fix. accurate fix to use in locating Howland. how far to aim off. Looking at this uncertainty in the north-south direction you end up with a 30 nautical mile north-south uncertainty. Noonan would have made the same calculations based on his previous experience, maybe he even rounded this value up for extra safety. did not report descending to 1,000 feet until almost two hours later at 1818 Z.
to take sights at 1623 Z, only two hours and forty-nine minutes before the "must be on you"
would have used the right amount of offset to allow for the possible uncertainty. So these two cases mark the bounds of the possible uncertainty in the north and south direction, 47 NM if the last fix was obtained at 1623 Z and 30 NM if the last fix was obtained as late as possible (clouds permitting) at 1740 Z. Either way they would not have flown for hours southward still expecting to find Howland. ... If others in TIGHAR were to feel that a new MC Simulation has value though, I would be more inclined to put the time into it. Perform to self-set standards. If it interests you, working on it would be worthwhile. The whole question is moot: something about which reasonable people may reasonably disagree; something that can be argued endlessly; something that makes no difference to the next steps that need to be taken. Understanding the 157-337 message is part of the backstory for TIGHAR's searches on Niku. Getting a general sense of the challenges faced by AE and FN in using celestial navigation is helpful in assessing the odds of their ending up at Niku with enough fuel to transmit the post-loss radio messages that seem credible. Calculating with the greatest precision what route or set of routes have the highest probability under some untestable assumptions goes beyond those modest goals. I predict that if you do the exercise, you will find (as Randy did) many routes that work and some that leave them in the ocean. OK. Go for it. I'm sure you will find lots of people here willing to offer you peer review after you've built your model.